I couldn’t use the recommended RV-8 fuel system for my airplane. Because I am using a continuous flow fuel injection system, I needed a return line all the way back into the tanks. Stopping the return at the selector valve wouldn’t work. It doesn’t provide enough time and space for the fuel to cool and release the air bubbles. The big decision was how to run the lines. I came up with three options. 1. I could run a line from the right tank through a transfer pump to the left tank. Then run a line from the left tank to the selector valve and forward. This would be pretty easy to install. I didn’t like the fact that if my transfer pump failed, I couldn’t use the fuel in my right tank. If I left the transfer pump on too long, I would fill the left tank, and dump the remaining fuel overboard. I really didn’t like this either, but I figured that was part of good piloting. It is no worse than remembering every half-hour to switch tanks. 2. I could buy one of the $400 selector valves that switch feed and return lines at the same time. This would be the most expensive fuel system option. It would fix the trapped fuel issue, but would mean a few more lines to run. Good piloting would still be needed to remember to switch tanks every half-hour. 3. I could install two selector valves: one for feed, and one for return. This would be much cheaper ($20 verses $400). It would also solve the trapped fuel issue, has the same lines as option two, and would still require the pilot to switch tanks. This option adds one more benefit—it could be used as a poor man’s fuel transfer. If, for whatever reason, I found myself with a heavy wing, I could feed from that tank and return to the other. This would transfer fuel through the fuel rail of the engine to the other tank. Again, good piloting is required to switch back to the same tank for feed and return once the imbalance is fixed. 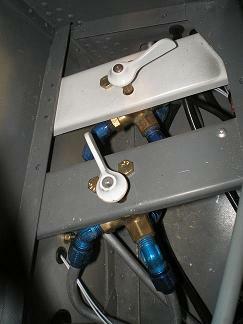 I started by installing a second fuel selector valve under the left mid cabin console, exactly like the first. Then I ran two lines from the valves, across the F-804, and out the right side of the fuselage, using the same route Vans recommends. The two lines to the left wing were much shorter, but not any easier due to the bends required. Last I ran the lines forward through the left gear box. I installed duel fuel pumps forward of the left gear box. 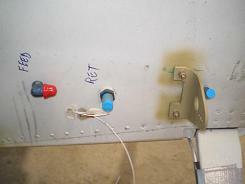 Since a fuel pump is a critical for flight item, I wanted the redundancy two pumps provided. I riveted a bracket onto the F-844-L auxiliary longeron. 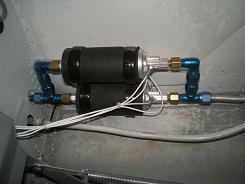 Then I used large adel clamps to hold the pumps. A piece of ¾ x ¾ aluminum box channel is the spacer between the upper and lower clamps. I decided to use bulkhead fitting everywhere that the lines left the fuselage. 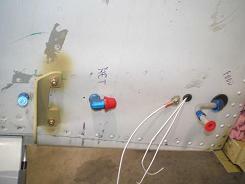 This let me make the wing tank to fuselage lines after the wings were hung. This worked for all the lines except the left wing return. I couldn’t make the turns tight enough to use a bulkhead fitting. But by running the line through the fuselage with a rubber grommet, I could make the bend work. The last parts I installed were the vent lines. These are much easier to bend and manhandle into position. 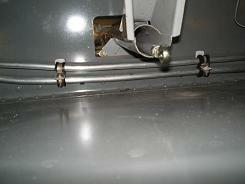 If you have never bent or flared tubing, check out my comments on each.